Saddle River Day School's Graphic Arts II students present their completed project to Gift of Life CEO Jay Feinberg via videoconference. When Gift of Life CEO and Saddle River Day School (SRDS) alumnus Jay Feinberg visited the school in October 2016 to explain the organization’s mission to students, one teacher saw an opportunity. Keri Eisenberg, who teaches art and graphic design in grades 4 through 12, approached the school’s dean about doing a project with Gift of Life. SRDS practices collaborative, interdisciplinary, project-based learning, designed to give students the best chance of success in their post-secondary education and careers. 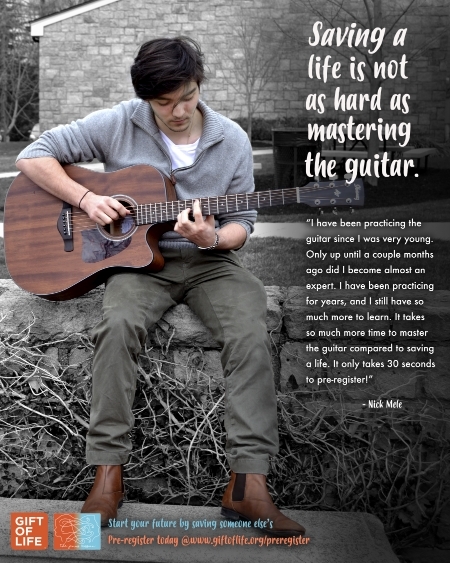 The opportunity to work directly with a non-profit organization founded by one of their own alumni was a perfect fit. A phone call with Jay was arranged, and the project took shape: Keri’s Graphic Arts II students would conduct an analysis of Gift of Life’s Senior Swabbers pre-registration program for teens and develop a fresh new publicity campaign that would appeal to teens 14 to 17. Those 17 and under may pre-register to receive a cheek swab kit from Gift of Life on their 18th birthday to sign up. The students’ first goal was to learn the science behind bone marrow transplantation. So, the GAII class teamed up with the biology teacher to learn about blood cancer and transplantation in depth. Students were divided into teams to research topics such as the causes of cancer and how matches are found between donors and recipients, and then presented their reports to the entire class. They also learned techniques of writing advertising copy from the English teacher, then went to work as graphic artists to turn their ideas into designs. 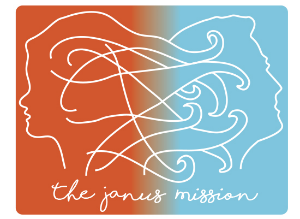 Back in the arts studio, the GAII students developed a theme for Gift of Life’s recruiting effort: The Janus Mission. By selecting Janus, the Roman god of passages and gateways, they symbolized the transition young adults go through as they turn 18 and become legal adults. They created a powerful tagline for the mission: Start your future by saving someone else’s. Using this theme, the team then created a logo, print advertisements, an online animation, a commercial, a website design, social media filters and a GoFundMe page. Each item was designed to appeal to the teen audience with lighthearted fonts and a storytelling approach. The GAII students felt that Generation Z is so media savvy that their eye bypasses traditional advertising displays, so using stories of real teens would be more relatable and gain their attention. At the culmination of the project in May 2017, the team set up a videoconference meeting with Jay and presented their work. “It’s a compelling campaign with relevant, accessible and motivational messages,” said Jay. Saddle River Day School is passionately committed to preparing students not only for college, but for life beyond formal education. The school challenges each student as an individual, knowing that every person acquires skills and maturity at a different pace. At each step of growth the mind needs to encounter ideas, demands and expectations to continue a trajectory to intellectual excellence. SRDS expects our students to achieve, and they do, in an atmosphere of personal care, strong student teacher bonds, and intellectual challenge.